Installing sod is the fastest and easiest way to the establishment of a new yard. There is no waiting for weeks on end for the grass seed to germinate. You do not have to fight off the hordes of birds and bunnies wanting to snack on your new seeds and seedlings. You simply prepare your soil, purchase the sod from a local farm, and by the end of the day you will have lush green grass to enjoy. To install a beautiful sod lawn that will last for years, prepare the soil first. Start with a rough grade of the area, by filling in all holes and removing loose rock. There is no need to make it perfect at this stage. It is important to consider any drainage issues that may arise, such as dips in the soil or having the lawn grade sloping directly at your house. You want a grade that will direct water away from the foundation of the house. A 4x8x6 piece of timber with two ropes attached to it will make a drag that can help facilitate this rough grade process. Simply drag it around in all directions until the area is flat. Add nutrients to the graded soil to ensure its compatibility with the new sod. While sod comes with its own topsoil, adding lawn-starter fertilizer and limestone at a rate of one pound of nitrogen and 50 pounds of limestone for each 1000 square feet will give your sod the foundation it needs. Rake or till these amendments about six inches deep into the soil. Re-grade and fine-rake the soil, removing any rocks, twigs or other debris. Wet the soil thoroughly and rake it again. This helps to keep the dust down while raking as well as helping to pack the soil. Roll over the wet soil using a weighted lawn roller until the soil is firmly packed. In this step, you will see areas that have dips in them and may need some further raking. Rake and roll the soil until all dips and humps in the soil are gone. Small dips or gradual hills are fine; you are trying to remove holes and humps that will cause tripping and drainage problems in the grass later. Wet the area thoroughly and allow it to slightly dry before starting to roll out the sod. You want the soil to be moist; however, you do not want a mud hole to work in. Lay your sod, pulling all the seams tight, and re-roll with your weighted lawn roller when the sod is in place. This insures proper contact between the new sod and the soil underneath. An underground irrigation system will help to take the chore out of watering the new lawn. Install one after Step 2 if you choose to do so. 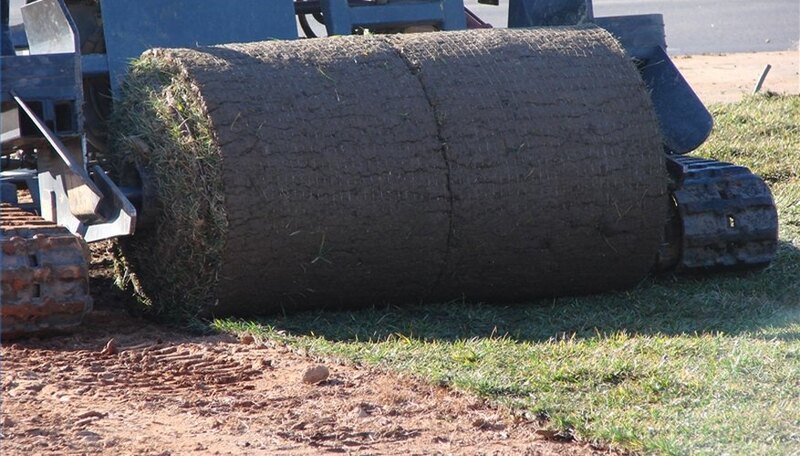 Sod rolls are heavy; be prepared to work hard on this project. Lift with your legs, not your back.